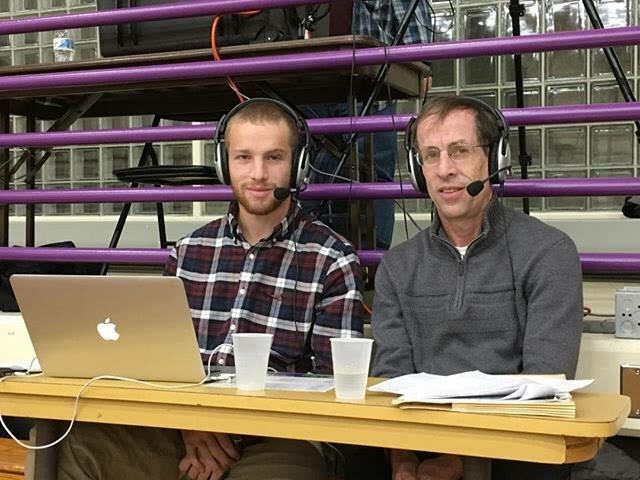 Alan Hirsch, chair of justice and law studies at the College, is the voice of Eph basketball. He announces every home game, often with a student by his side to provide color commentary. The games are broadcast online to fans beyond Williamstown on Northeast Sports Network (NSN). In November, when the athletics department needed an announcer to provide commentary for the NSN live stream on short notice, Hirsch, who has attended nearly every home basketball game at the College since 2003, was a natural choice. His son Eric Hirsch ’19, a men’s soccer player who works for Sports Information, was also invited to join him on the air. Alan’s wife, Marjorie Hirsch, professor of music, insisted that they take the opportunity. “After years of watching basketball games together, whether in Chandler Gym or on TV in our basement, it seemed like a once in a lifetime opportunity, so we decided to give it a try,” Eric said. Considering Alan Hirsch’s enthusiasm for Eph basketball, it is suprising to many that he is actually an Amherst alum. During his time there, Hirsch competed briefly on the wrestling team. “My dirty secret is that I don’t take the rivalry too seriously,” he said. Although Hirsch was already an avid basketball fan, becoming an announcer meant learning the minute details of the sport. He also memorizes the numbers, names and faces of players from the opposing team before each game. While Hirsch usually sticks to the play-by-play and lets his student guests add in more lively narration, he has developed a few signature sayings. “He always keeps me on the edge of my seat with his interesting catch-phrases,” Eric said. For both Alan and Eric Hirsch, announcing is a new way to engage with a sport and a team they have spent 15 years rooting for.